The mini load combines scalable storage capacity of unit loads with medium throughput demands. The technology is often used in environments where large quantities of totes or cartons need to be stored in a warehouse with a small footprint. This solution makes optimal use of the total height of the building. Unlike shuttle systems, mini loads are a dynamic storage and retrieval solution for storage of items with an average or low turnover speed. 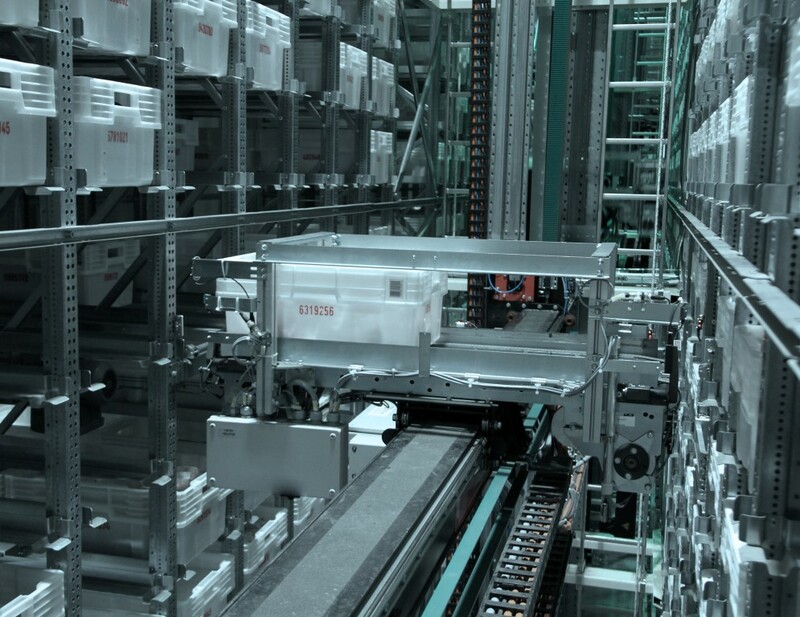 In the receiving area, products are placed into standardized containers (bins or trays) that are conveyed to infeed points for the automatic storage and retrieval system (AS/RS). Depending on the load handling device used, the mini load can handle stock bins containing products as well as trays carrying cardboard boxes. The bins or trays are stored at and retrieved from a storage location by an aisle-specific crane. Typical mini load applications with one mast can reach heights of up to 16 meters. The Inther mini load operates extremely accurately, even at high speeds. Thanks to rapid positioning and acceleration, it retrieves the relevant unit loads quickly. The capacity can be further increased by handling two bins simultaneously. The mini load is often implemented as the core of a Goods to Man solution for medium or slow-rotation articles. Totes or cartons containing inventory are automatically retrieved from their storage location as soon as they are needed for picking. Inther is an international system integrator with a full scope of techniques for successful completions.